Discussion in 'Mac mini' started by dbasco, Mar 1, 2013. I just bought a brand new Mac Mini Late 2012 i7 2.3Ghz 1TB HDD 4GB RAM. I will be playing with it for a while before actually putting it into production, and will be doing some testing/benchmarking. You know, you could just pull up all of the benchmarks that everyone else has previously done and save yourself a lot of time. I mean if you want to do all those benchmarks, go ahead. But the Mini has been out now for 6 months and has been thoroughly tested over and over again. 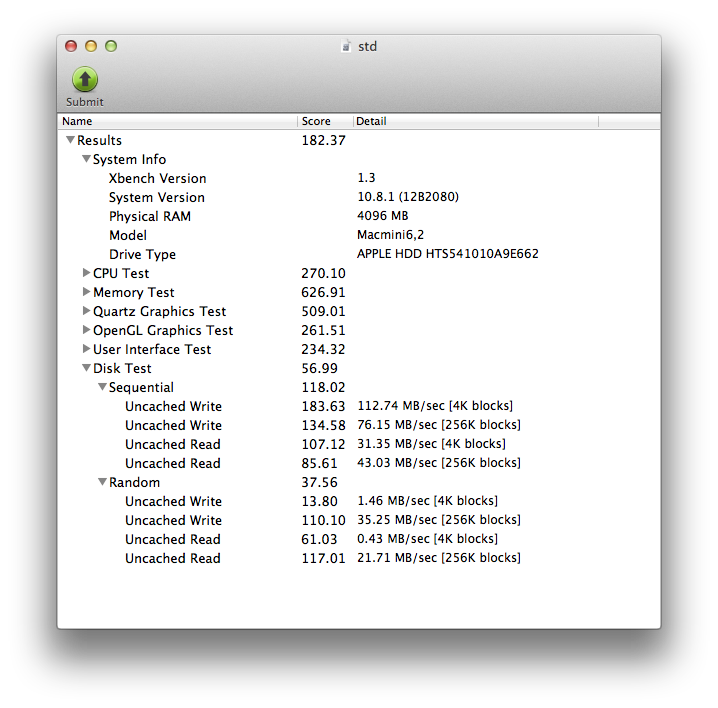 About the only test I could say I am even remotely interested is the RAID 0 benchmarks. I don't believe in RAID 0 and believe that with SATA 6 SSD's, the advantage of RAID 0 is almost nill so it would be interesting to see that proven or disproven. What I am really curious about are boot times, large application load times, etc. Yes we all know that synthetic benchmarks RAID 0 wins, but in real life the few times I have tried RAID 0 nothing "felt" faster. OS didn't boot any faster and none of my Apps really booted any faster. Basically the risk/reward of RAID 0 just wasn't there. Doubling my failure rate to get virtually no gain in real world experience wasn't there. Basically I would love to see a stop watch of when you hit power to OS fully booted if that makes any difference in RAID 0 vs single SSD. Are higher numbers better? In which case, RAID 0 is not as good as two separate SSDs. The only reason I can see for RAID 0 is just to create a larger continuous volume. What do you plan to do with your Mini? I guess your usage may be a factor in how to configure it. The CPU / Memory / Etc. numbers would be unaffected by the RAID 0. The differences are anecdotal. Most review sites run their benchmarks multiple times because there can be minor differences in numbers due to unexpected OS processes. Really those numbers are a push. Where the RAID 0 shows, is in the Disk Tests. However, synthetic benchmarks always show how "great" RAID 0 is, but rarely in real life experience do these numbers actually equate to any real gain. 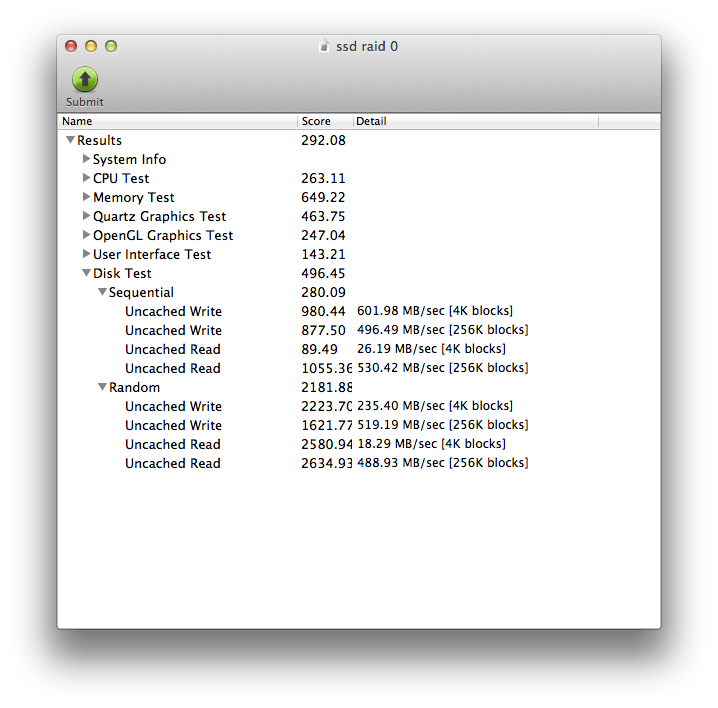 Well we tested this and put side to side to identical systems one with 2 SSDs inRAID 0 and one with a single SSD. Identical results. Basically as soon as the Apple dissapears we get the login screen. No wait time in between. From the point of view they are identical. The only process intensive tasks I will perform are some FULL HD video rendering (1-3 minute videos).... And will do some testing in this aspect in the next days. I come from Windows and will continue to have my main system on my Windows machine until I finaly decide how I will setup my Mac Mini and then make the Mac Mini my main machine. So will continue to test and try stuff in the next days. Obviously comparing RAID 0 on conventional hard drives to SSDs is largely apples to oranges. The same size SSD is going to cost a fortune, though and so the comparisons get strange. But if you already have the hardware, RAID 0 makes sense, especially with conventional drives (and I guarantee you they are very REAL gains with a conventional drive; my boot time is less than 1/2 now and the tests show 2.5x gain). So basically, you've got 1/2 the speed of a single SSD at maybe 1/3 to 1/4 the cost (better speeds yet if the drives are 7200 RPM models instead) not counting what you're paying for when you buy a Mini (they all have to come with something that you're going to either work with or throw out/sell). So I suppose it's all about priorities. I'm pretty happy with 251MB/sec for daily stuff. I just bought a Mac Mini Server with 2 x 1TB disks. Because the machine is not delivered with RAID, I need to install it myself. Everything (OS X Mountain Lion / OS X Server) is already installed and configured on one of the drives.